Megan Rae Maxwell is a passionate barber and business owner. She is from Knox, Indiana, a small town with a population of under 4,000 people. She is a licensed cosmetologist of six years and became a licensed barber in September 2017. Megan trained under Terry Bean at Rated Next Barber School in LaPorte, Indiana. Megan is very passionate about barbering. She views it as so much more than a service, but an experience. Hot towel shaves and shampoos that focus on scalp massages are her most popular services. She has shifted her services to natural healing practices, including essential oils and relaxing music. Megan considers the atmosphere that she can create for her clients is her specialty. Megan shared that she was inspired to become a barber by her people. “My people” is what she affectionately calls her clients. She was working in a chain salon while pursuing her communication degree when she accidentally built a clientele. At the time, she was only offering haircuts, but she continued to expand, and she felt in her heart that she could provide more. After a year of meditation, Megan decided to withdrawal from college and enrolled in a Barber school; the rest is history. Megan received an overwhelming response when she posted her ASMR haircut video on YouTube. Before Megan is a barber or business owner, she is a dog mom. She has two pups named Lilly Mae and Hemingway. She spends most of her time with them when she is away from work. They hike, travel, visit coffee shops, read, nap, and see Lake Michigan a lot. One interesting fact about Megan is that she is a barber with a fused spine. She has over 20 titanium pins in her back due to having scoliosis as a child. Megan shared that iStudio Salons has been good to her in so many ways. Her favorite thing is the attention to detail and cleanliness. She went on to say that our maintenance team is on top of things and she receives ample compliments from her clients about how beautiful the salon is. She appreciates being able to run her business in a space that showcases her and her client’ worth. Like many of us, Megan finds herself continually changing her future plans. But, her goals have always remained the same. She wants to spend her life using her gifted passion for doing a lot of good for the world. She hopes to change lives for the better one haircut and shave at a time. She is by appointment only, but you can conveniently book her online. She also keeps her Facebook up-to-date with any last minute cancellations and shop updates. Master Barber Berman Rodriguez, owner of Roc’s Barber Shop, has been a barber for over 11 years. He provides hair cutting services and facials. He was first inspired to cut hair when he started seeing this 15-year-old kid cutting hair from his grandmother’s garage. He would notice a lot of people receive haircuts from him. Berman studied barbering at Florida Technical College in Kissimmee formerly Central Florida College. Rodriguez hails from “Brick City” also known as Newark, New Jersey. He moved to Florida around age 11. When he is not behind the chair, he enjoys spending quality time with his four children. One unique thing about Berman is that he used to be a rapper. He also holds a great lease on life. He manages to maintain a smile in the midst of whatever may be going on in his life. Rodriguez’s favorite thing about being a salon suite owner at iStudio Salons is having privacy and the opportunity to learn from other salon professionals in the community. In the future, Rodriguez plans to continue to strive for creativity and to continue to grow as a hair artist. He wants to study cosmetology to expand his service offerings into women’s hair. One of his constant goals is to strive to be better not for perfection. Rodriguez advises other salon professionals to be persistent and take the time to hone in on their craft. Berman Rodriguez is located in Studio 10 of iStudio Salons’ Colonial Town Center. Visit here for online booking. Master Stylist Rebekah Puroll has always had a knack for being creative. The Orlando, Florida native discovered her affinity for hair in high school as she worked at theme parks as a face painter. Her canvas expanded from faces into hair as she practiced vintage styling and punk rock inspired hairstyles. Rebekah studied cosmetology at Westside Tech in Winter Garden. She has been a stylist for eight years. She specializes in color, fashion color, balayage, and vintage hair styling. Rebekah’s unique style shines through in Studio 5 of iStudio Salons College Park. Her retro inspired salon space incorporates mint, teal, and gray colors along with ornate mirrors, frames, vintage hair dryers and prints. Rebekah enjoys having the ability to share her personality and style with her clients. iStudio Salons enables her to connect more with her clients on a one-to-one basis within a salon environment. When Rebekah isn’t in the studio, she enjoys traveling with her husband, antiquing and refurbishing furniture. Some of her future goals include traveling to do hair and branching out into other parts of the hair industry. Click here to book with Rebekah! When blow drying your hair at home, make sure you use the concentration attachment and direct the heat vertically from the top of your head down to the ends of your hair to avoid frizz and damage. And always use a heat protectant before blow drying. Matthew Johnson, LMT has lived in Orlando for 6 years and moved from Melbourne Beach, Florida. Been a message therapist for 15 years, and he graduated from Space Coast Health Institute. He’s located in our MetroWest location in Studio 7 at 6996 Piazza Grande Avenue. His Influence for picking his room design and color scheme was trying to find a look and feel that was calming and relaxing. 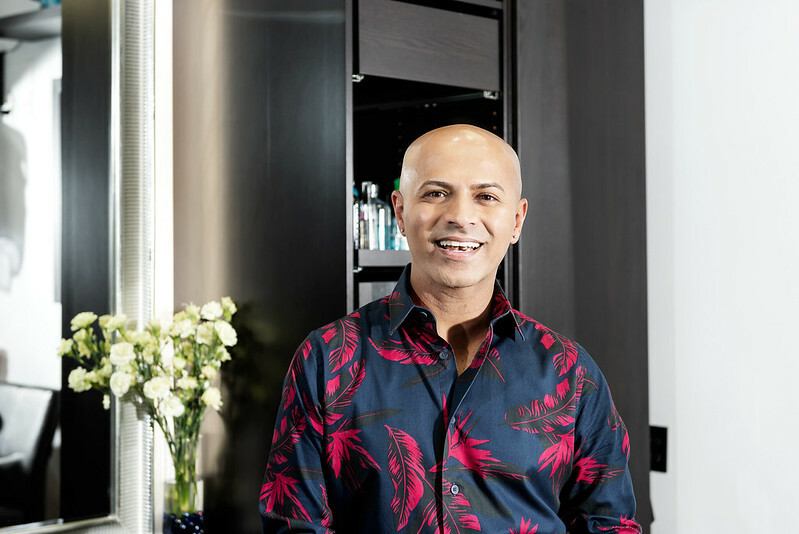 “When my clients walk into my room, I want them to feel totally tranquil and at peace”, Matthew says. He focuses on sports massages and does more of an active massage, and focuses on one specific area. His main clientele is performers, entertainers and athletes. When asked what sets him apart from other massage therapists, “My attention to detail. When you come in and complain of certain issues or have certain needs my main focus is to really start off at that area”, he says. His specialty is how he stretches the back, the neck, the hips, and arms. I have really liked the friendly service and staff at iStudio Salons. It has been very pleasant and reliable to a point where I didn’t even give the other ones a second look. His goals in the next 5 years – is to have his own Wellness Complex set up for all the performers and athletes in the Central Florida area. He’s been married for 2 years to his wife he met in high school. Has an Australian Shepherd named Coda that is 5 years old and just had a baby boy. Mention this Facebook ad and receive a free Biofreeze treatment with hot towels. You can make an appointment by calling or texting 321-749-0882. Find him on [email protected] and on Facebook: Healing Arts of Central Florida.